In addition to the benefits of vitamins and minerals found in whole foods there are phytocompounds in various plants that give therapeutic properties. Most studies on plant nutrient values make reference to sprouts. Sprouts are easy to grow and they are nutritious. So are microgreens, but they are not as commonly grown because the technique is not as familiar. But growing microgreens is as easy as growing sprouts. Instead of germinating seeds in jars and bags, microgreens are germinated on a level surface and the young plants are allowed to grow up, while the roots penetrate the media or in soilless systems the water. It is a common practice to just add tap water to grow sprouts and microgreens. This assumes that all the nutrients required are present in the seed itself. An amazing feet when one considers the minuscule size of most seeds. However another approach may be warranted. is that plants can be given a fertilizer without getting nutrients on the leaves or stems of the plant. It can be done with sprouts, but sprouts require a lot more diligence in maintaining sterility and cleaning the finished product. This is because with sprouts the roots are also eaten. With microgreens, the roots are not consumed, the 2-3" plants are cut to the base and the green leaves and stems are consumed. When growing microgreens in the Biogarden, organic nutrients are used and none gets on the plant itself. When sprouts it was shown that the sulfur rich water enhanced the production of key phytochemicals, with respect to broccoli sprouts, that would be sulfurophane. This can be done by adding a sulfur powder to the nutrient fertilizer solution. Sulfur is an organic additive. 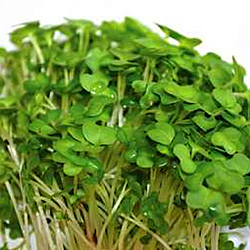 Growing broccoli sprouts and microgreens, with their high sulfurophane content, are recommended by Dr David Epstein, D.O. for autistic children. "They are loaded with sulfurophane, a potent antioxidant. Autstic children, quite often, suffer from oxidative stress and benefit by adding this to their diet." A highly therapeutic serving of broccoli microgreens can be added to a blended smoothie, salad or soup. Eaten alone, with lemon juice and Braggs liquid minerals and a dash of cayenne pepper will do wonders for a stomach ulcer and from other articles I've seen help with gallbladder and general gastrointestinal cancer prevention. The Linus Pauling Instutute defines phytochemicals "in the strictest sense, as chemicals produced by plants. However, the term is generally used to describe chemicals from plants that may affect health, but are not essential nutrients. While there is ample evidence to support the health benefits of diets rich in fruits, vegetables, legumes, whole grains and nuts, evidence that these effects are due to specific nutrients or phytochemicals is limited. Because plant-based foods are complex mixtures of bioactive compounds, information on the potential health effects of individual phytochemicals is linked to information on the health effects of foods that contain those phytochemicals." Nine patients with gastritis and Helicobacter pylori infection were randomly assigned to receive 7g, 14g, or 28g of broccoli sprouts on an empty stomach twice a day for seven days. Stool antigen testing for H. pylori was done at the end of the treatment period (day 8) and at day 35. Urea breath testing (another test for the presence of H. pylori) was performed on patients who had a negative stool antigen test at day 35. Seven of nine patients (78%) were stool-antigen-negative at the end of the treatment period, and six remained negative at day 35. H. pylori eradication was confirmed by the urea breath test in one patient from each of the three dosage groups. Of the four patients who had symptoms at baseline, two improved, one had no change, and one reported worsening. Six patients rated the taste of broccoli sprouts from acceptable to very good; one patient stated they were "not good." Comment: H. pylori infection of the stomach is associated with peptic ulcer and gastritis and appears to increase the risk of developing gastric cancer. Conventional treatment to eradicate H. pylori usually consists of two antibiotics and a proton-pump inhibitor. While this "triple therapy" is usually successful, it can cause significant side effects and may also promote the development of resistant strains of the organism. A number of natural alternatives to triple therapy have been tried, but none have a high success rate (see Gaby AR. Altern Med Rev. 2001;6:355-366). Broccoli sprouts contain sulforaphane, an isothiocyanate that has been found to inhibit H. pylori in vitro. Broccoli sprouts contain 20-50 times more sulforaphane and related compounds than does mature broccoli. The results of the present study suggest that eating broccoli sprouts for one week can successfully eradicate H. pylori in at least one-third of cases. Broccoli sprouts glucosinolates, stimulated by adding sulfur during germination. Pérez-Balibrea S, Moreno DA, García-Viguera C.
"Sulphur (S) fertilization is essential for primary and secondary metabolism in cruciferous foods. Deficient, suboptimal, or excessive S affects the growth and biosynthesis of secondary metabolites in adult plants. Nevertheless, there is little information regarding the influence of S fertilization on sprouts and seedlings. An experiment was set up to evaluate the effect of S fertilization, supplied as K(2)SO(4) at 0, 15, 30, and 60 mg/L, on the glucosinolate content of broccoli sprouts during the germination course of 3, 6, 9, and 12 d after sowing. Glucosinolate concentration was strongly influenced by germination, causing a rapid increase during the first 3 d after sowing, and decreasing afterwards. The S supply increased aliphatic and total glucosinolate content at the end of the monitored sprouting period. S-treated sprouts, with S(15), S(30), and S(60) at 9 and 12 d after sowing presented enhanced glucosinolate content. Overall, both germination time and S fertilization were key factors in maximizing the bioactive health-promoting phytochemicals of broccoli. Practical Application: Germination with sulphate is a simple and inexpensive way to obtain sprouts that contain much higher levels of glucosinolates (health promoting compounds), than the corresponding florets from the same seeds." This entry was posted in Uncategorized and tagged Broccoli, Fertilizers, microgreens, Phytocompounds, Sprouts.